Want to hone your baking skills? 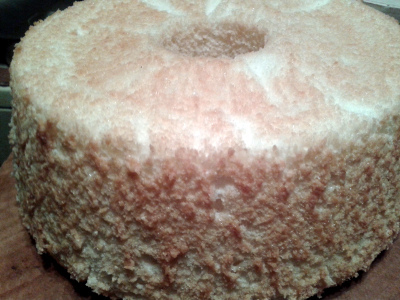 January's cake is Citrus Angel Food Cake. As I had just recently made Lemon IceBox Pie for a work event, I actually had NINE extra large egg whites in the freezer – which was amazingly the exact amount called for – this seemed like fate! Well, as always, there was a hitch – I had no lemons. Even stranger, I had no bottled lemon juice or dried lemon zest? All three are staples, and yet... BUT – I DID had lemon extract!! A heaping teaspoon went into the sugar to saturate. 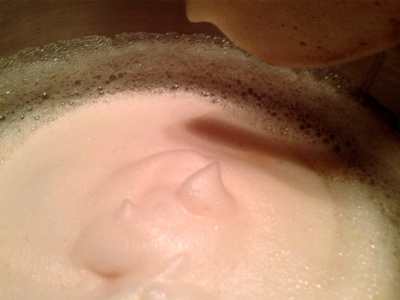 Started to whip the egg whites (with cream of tarter and vanilla) to the soft peak stage - so far so good. 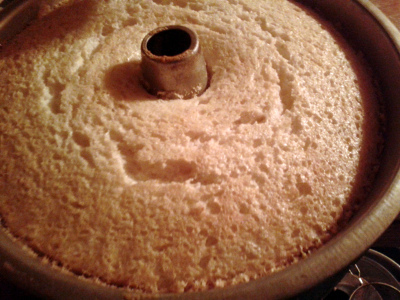 But when I started to add the flavored sugar everything went flat. Literally. Egg whites don't like fat, and while fresh zest has it's share of natural oil, apparently the extract had more. I had everything else measured out, so I kept on going if for no other reason than to show how easy it is to fail, lol. 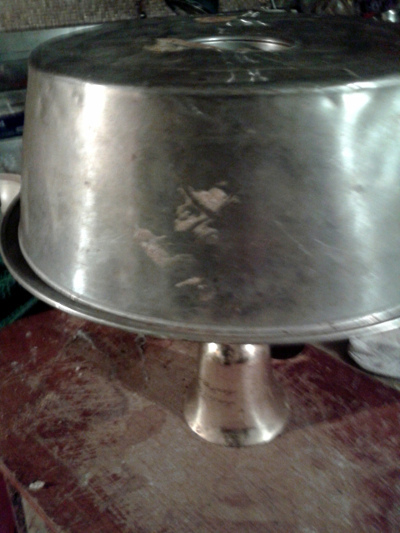 Folded in the flour mixture, spooned into my antique tube pan (I'd cut a piece of parchment to fit the bottom for easy removal), put in the oven and waited. Okay, it inflated some more! Not bad!!! Not bad at all! The recipe includes the ingredients for a glaze, but not the instructions – but you simply whisk them together. 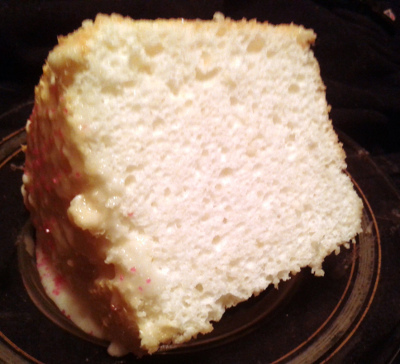 If I'd had sliced almonds, or maybe some white chocolate shavings I might had added a handful – but sprinkles were enough to make it pretty. 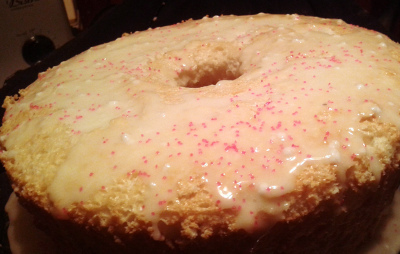 Kind of looks like a doughnut, doesn't it?